Thirteen years since our world changed forever. although we have wonderful memories there will always be the hole left in our hearts. I pray for solace for all those that love and remember you for I know both the pain and pride are forever. Your family is in my heart's embrace. Thanks to your friends dor sharing their memories and devotion to you through their reflections. I never had the pleasure of meeting you but had I ever gotten that chance I am sure we would have enjoyed working together. I wanted to say I truly wish you were still here. So many people I have met say so many good things about you. They miss you and are sad you left us at such a young age. If you set out to make an impression on people, to make people smile, that is exactly what you did. I have had the pleasure of meeting your immediate family. They are wonderful folks whom you blessed with your presence in this life. It shall always be an honor knowing I wear the same badge that you gave your life for. God Bless you. I was reading about two unfortunate female officers recent deaths & thought of you. I have written many times, we never met, but we share a birthday & a partner. I pray fo ryour family. I think of you often and you are dearly missed. Tonight we sent up a prayer in honor of you. We think of you daily. May you watch over all of us always. We are getting together tonight to honor your memory. I so wish we were getting together with you to celebrate a happy occasion. You are missed and loved so very much. Hey Sweet Tiff, just thinking of you and missing you... here's a little poem... miss you dearly, much love as always! I sure do miss you...I know God has a plan and He had His reasons for taking you....but I sure do miss you. Wishing you and your family another Merry Christmas. Hey sweet Tiff, just thinking of you this day and really missing you! Hard not to get mad that you are not here, not fair, but I know God knows why as it is in His perfect love for us He has a perfect plan. Miss you dearly, much love as always! Thinking of you and all of your loved ones and close friends on this day. Continue to keep watch over all of them. You are a true hero and will never be forgotten. Still remembered by this dutch member of the brotherhood. Today we go to honor Tiffany. Someone I never met. I pass your picture daily and smile, because I know she has my back. It is so hard to believe it has been 11 years. Just know that it is still as difficult now as it was then. Your memory is a keepsake,with which I'll never part. God has you in His keeping,I have you in my heart. I still have your obituary up on my refrigrator. Although it has yellowed and dried, it still reminds me everyday of why we do what we do.Friends and family always see it ask about you, and I hold back my tears to tell them the story. You are Greatly missed. 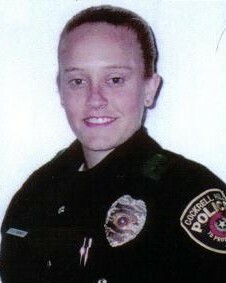 Tiffany, you are always the first person I think of when we've had an area officer killed in the line of duty. I'm sure you are making fast friends with Arlington PD Officer Story. You and your family are always in my prayers. 10 years, and I still miss you so much. Hey sweet Tiff, we tragicly lost a brother in blue today, as he joins the rest of you heros in heaven who paid the ulitimate price while serving please give him hug for us. As always you are our angel that we miss so much, we love you and continue to think of you everyday. Thinking of you on Christmas Day!